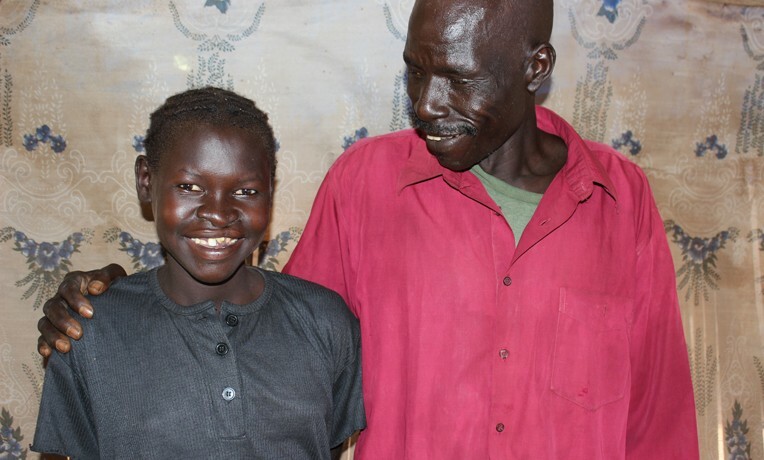 Houda, a cleft lip and palate surgery beneficiary, smiles next to her father Mohammed. Beginning Monday, April 18, and running through Friday, April 22, a 24-member Samaritan’s Purse medical team will be performing free-of-charge cleft lip and palate surgeries at the Juba Teaching Hospital in South Sudan. The hospital has hosted these surgeries for the past 6 years, and more than 100 patients are scheduled for treatment during the week. Houda, pictured before her cleft palate surgery 2014. The patients will come from throughout South Sudan. Many live in isolated locations. They will be transported to Juba—along with their caretakers—by our Mission Aviation Services-East Africa team. These flights are their lifeline to the capital because South Sudan has few passable roads and the ones that do exist are often times far too dangerous to travel because of ongoing armed civil conflict. In South Sudan, people who are born with a cleft lip are often considered cursed and are shamed publicly. A repaired cleft lip can change their lives almost overnight. That certainly was the case for 14-year-old Houda. She is from the Nuba Mountains of Sudan and fled along with other family members when their village was bombed. They arrived at the Yida Refugee Camp in South Sudan more than four years ago. She and three of her eight siblings are being raised in Yida by her father Mohammed. Houda’s cleft lip surgery was conducted by Samaritan’s Purse in 2012. She came back for the cleft palate surgery two years later. Houda is the first cleft palate patient of Samaritan’s Purse in South Sudan. Normally extremely shy, Houda had enough confidence to walk up to and get reacquainted with our information and communications manager in South Sudan at a recent showing of the Jesus film in Yida. Some 500 refugees attended the showing on a dusty field after sunset. The two had met before her first surgery and have kept in touch over the years. Please pray for our medical team and the patients who will receive surgery during this campaign.